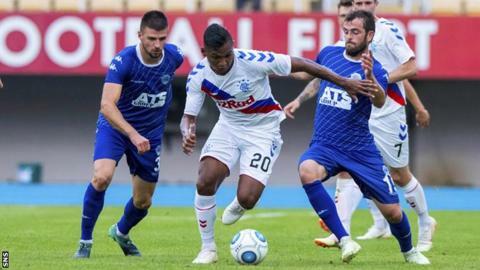 Rangers progressed to the Europa League second qualifying round after a goalless draw with Shkupi in Macedonia. The visitors, holding a 2-0 advantage from last week's first leg, were seldom troubled, with Josh Windass and Glenn Middleton coming closest to a Gers goal in the second half. Muarem Muarem almost scored to set up a nervy final two minutes, but his shot was well blocked by Allan McGregor. Steven Gerrard's men will face Petrocub or Osijek in the next round. The Moldovan and Croatian outfits meet on Thursday with the aggregate score 1-1 from the first leg. Ron Broja and Basil Nchama combined to engineer a chance to give Shkupi the perfect start, but James Tavernier was on hand to block the shot, another important intervention in this tie after his late penalty in the opening encounter. At the other end, Jamie Murphy twice threatened to make the decisive breakthrough. His close-range effort from Alfredo Morelos' cross was deflected wide, then the midfielder just failed to reach a terrific Tavernier ball with his head. The Rangers skipper put his side in trouble soon after, though. He surrendered possession on the touchline midway inside his own half and Baze Ilijoski fired in a shot from 20 yards that McGregor could only divert behind. A couple of corners flashed dangerously across the Rangers box and Muarem called McGregor into action again with a powerful drive as Shkupi served notice they believed there was life in this tie yet. Windass almost got the goal to take the sting out of the contest when he carried the ball 60 yards to reach the penalty box, but his effort was too close to goalkeeper Suat Zendeli. Morelos could and probably should have put the tie beyond doubt in the final minute of the first half when Tavernier's clipped ball found the Colombian alone in the box. However, his first touch was awful and the chance was lost. After the break, Windass drew a brilliant save from Zendeli when he cut in on his right foot and struck a fierce drive from the corner of the box. Tavernier again tested the Shkupi captain with a curling 30-yard free-kick. Rangers were in complete control and the only thing missing was a goal to put the tie to bed. Middleton, impressive off the bench in the first leg, was presented with arguably the chance of the game when slipped in by a lovely pass from fellow substitute Ovie Ejaria, but sliced his effort into the side-netting. Just as it seemed Rangers were cruising home, Muarem left Connor Goldson for dead and would have scored the opener in the 88th minute but for an excellent one-on-one save from McGregor. A rare moment of panic on a generally comfortable night for Gerrard's men as they successfully negotiated the first of four hurdles to Europa League qualification.